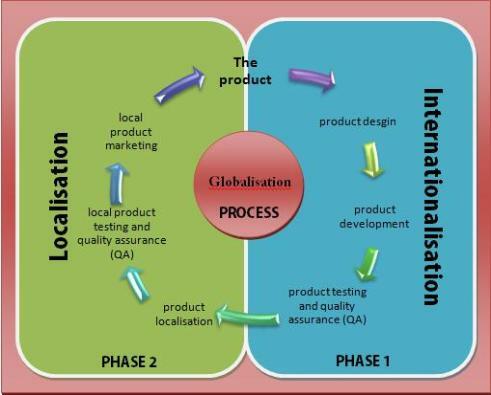 What are globalization and language localization? Tom G. Palmer of Cato Institute defines "globalization" as "the diminution or elimination of state-enforced restrictions on exchanges across borders and the increasingly integrated and complex global system of production and exchange that has emerged as a result." Thomas L. Friedman "examines the impact of the 'flattening' of the globe," and argues that globalized trade, outsourcing, overseas supply-chains, and political forces have changed the world permanently, for both better and worse. He also argues that the pace of globalization is quickening and will continue to have a growing impact on business organization and practice. When used in a business context, globalization refers to the reduction and removal of barriers between national borders in order to facilitate the flow of goods, capital, services, and labor. Internet access and e-commerce have brought small-scale co-ops in Third World nations into the same arena as thriving businesses in the industrialized world, and visions of low-income workers weaving rugs on primitive looms who compete with rug dealers in major cities are not far-fetched. Globalization has affected workforce demographics as w﻿ell. Tod﻿ay's workforce is characterized by greater diversity in terms of age, gender, ethnic and racial background, and a variety of other demographic factors. In fact, management of diversity has become one of the primary issues of 21st-century business. Language localization is the process in which a product is adapted to reflect local cultural norms and local dialect. Localization is more specific and detailed than translation, because it adjusts for local market differences and local needs. Software, video games, and websites are most frequently in need of localization services, although other written translations may need to be localized as well. Localization may be necessary in countries where several languages are spoken, or to accommodate different idiomatic expressions. For example, Spanish is spoken across Latin America, but colloquial expressions vary from country to country, and even between regions within countries. Read about what's happening with language. If you want to interact with people in a foreign language on the spot--a lab tour with Mexican visitors, a board meeting in Japan, a parent-teacher conference with a family recently arrived from Somalia--you need an interpreter. Learn why pro﻿fessional interpreters are more than jus﻿t bilingual (or multi-lingual) speakers. Read our whitepaper about what you need to do to hire and retain great interpretation service.